Originally intended to be a tractor for military or agricultural use, it was given an armored and armed upgrade which converted it into a tank to attract new markets. In its original tractor form, it would prove to be effective and able to carry out its task reliably. The tank upgrade would see service as a product of circumstance during the Spanish Civil War. In 1935, Commander Victor Landesa Domenech, an artillery officer attached to the Trubia arms factory in Asturias (Northern Spain) and Rogelio Areces, the Trubia arms factory’s Chief Engineer, teamed up with Captain Carlos Ruíz de Toledo, a Commander in charge of Batería de Carros de Asalto de Artillería [Artillery Tank Battery] during its first engagements during the Rif War (1911-1927), to design a tank on their own initiative. This tank would become Spain’s first indigenous tank and was to overcome the major faults of the Renault FT, Spain’s most available tank at the time. The prototype improved upon the FT with increased power in an innovative system involving two overlapping turrets moving independently and each armed with a Hotchkiss M1914 7mm machine gun and marginally improved armor and engine power. The design was considered a success and an improved model was built, the Trubia Serie A. The main difference of the serial version compared with the prototype was its larger size, an additional crew-member, and, most importantly, a new suspension system and engine acquired in Germany. This apparatus was supposed to improve upon traditional arrangements in addition to enhancing turning capabilities and minimizing the effects of the tracks on roads. In this integrated track design, the links were suspended from the chassis and held together by a lateral metal wall. This system was designed to prevent the tracks from coming off when maneuvering. Four of these tanks would be built and tested in 1926. During the tests, deficiencies in the tank (especially in the new suspension system) were noted and modifications were recommended. At least one of the tanks was modified and re-tested far more successfully in May 1928. Although there was some interest in the tank, political instability, and lack of funding condemned the vehicle. In this context, Landesa Domenech and Areces embarked on a new project, which would again be a private venture, this time with the aim of creating a tractor for military and agricultural use. The tractor would be built following the same main principles as the Trubia Serie A, but with updates and modifications. Between the two tracks, there was a semi-open-topped platform above the engine and driver. The engine itself was covered by steel plates riveted together, with grilles on either side and at the front with eleven blades each. Atop this engine compartment was a headlight. Behind the engine was a steering wheel, the driver’s seat, which carried a small electrical lamp, and space for an additional crewman who acted as the driver’s assistant. The two lamps and the electrical equipment were made by Scinilla and were fed by a Tudor 24 volt battery. Each track consisted of a long ellipse-shaped structure formed by two parallel steel sheets covered by a mudguard. Between the two sheets, there was a track path for the track rollers to travel through. The tracks on either side were joined to each other by 4 u-shaped bars traveling underneath the tank. Between the steel sheets were some sort of drum brakes. Unlike in most other vehicles, the track rollers were integrated into the tracks and moved in unison with the track links along the tracks set between the two sheets. This was an updated copy of the one on the Trubia Serie A, albeit, smaller. The first vehicle was given a Mercedes 60 hp engine. The second and third vehicles used a SEFA engine of unknown horsepower. At least the ones equipped with SEFA engines initially used K.L.G. spark plugs. Some Spanish produced spark plugs from the Toledo arms factory were tested, though, once they proved unsatisfactory, they reverted back to the K.L.G. ones. At some point between October 1932 and 1934, it was decided that the Mercedes engines were superior to the SEFA, so the command was given to home-build the German engines. Some of the engine components were impossible to copy so they were ordered from Germany, which led to the accusation that Trubia, the factory building the engines, was carrying out an unauthorized copy (which indeed it was). Fortunately for Landesa Domenech and Areces, this did not amount to anything more. Their justification was that Trubia was creating an experimental series of engines and did not intend to sell them. These new engines would be called Mercedes-Trubia and were presumably 60 hp. The next nine or ten vehicles would be equipped with this engine. In late 1935 or early 1936, four BOMAG heavy oil engines would be purchased for four new tractors, but only one would be built before the Spanish Civil War broke out in July 1936. The first tractor was built by Landesa Domenech and Areces with help of factory workers from the Trubia arms factory in the workshop of the Compañía Anónima Basconia in Bilbao, Northern Spain. There it was tested successfully by its inventors on the nearby Malmasín Hill. Landesa Domenech and Areces then decided to take their new tractor to Trubia with the intention of building it in series, despite not having a contract at the time. An external company, the naval-focused Juliana Constructora Gijonesa S.A., was contacted for the production of more tractors, but Landesa Domenech and Areces wanted to remain in Trubia due to the expertise of the workers there. Therefore, they reached an agreement to lease the factory of Industrial Química de Nalón in Trubia for the production of more tractors. There, the pieces for the tractors were built before they were presumably moved to the Juliana Constructora Gijonesa S.A. factory in Gijón where the two Landesas with SEFA engines were put together, though there is a strong possibility they never left Trubia. In October 1932, the two Landesa tractors with SEFA engines were sent to Palencia (central north Spain) to take part in the Maniobras del Pisuegra military maneuvers. These were the first military maneuvers of the new Second Spanish Republic (established in April 1931) and as such, attracted lots of interest and attention from the press and military officials from around the globe. The two tractors were sent for experimental use, but only one was used at the time owing to the lack of crew. They were attached to Grupo de Artillería nº1 [Artillery Group No. 1] and were put in charge of towing Skoda 76.5mm cannons. The artillery group had eight of these, so the tractors were kept busy. Inclement weather made matters worse, extremely muddy ground meaning that the already busy tractors had to pull immobilised and bogged down vehicles out of the mud. The overall performance of the tractors during the trials was deemed satisfactory. However, both tractors had breakdowns caused by the snapping of the structure linking the engine to the body-on-frame. Following the trials, a new Mercedes-Trubia engine was developed and one was installed in a newly built tractor. This tractor would be sent to the Escuela Central de Tiro (the Army’s testing ground) in Carabanchel (Madrid) to test its towing and overcoming obstacle capabilities. The tests were a major success, with the tractor being able to tow 15cm cannons and 155mm howitzers even through the mud of the Jarama River. As a result, the Army decided to place the order for nine with Mercedes-Trubia engines (it is unclear if these nine included the one tested in Carabanchel or not) to equip the Grupo de Artillería Antiarea nº1 [Anti-aircraft Artillery Group nº1] barracked in Carabanchel. Once these were built, as a publicity stunt, the nine tractors were intended to cover the 370km (230 miles) distance to Madrid by themselves driven by Trubia arms factory workers. They managed to cover the first 60km with ease until they reached the Pajares mountain pass (1,378m in height). There, the lead tractor driven by Constantino Alzueta and Zenón Soler (the two men in charge of driving the tractor in all the trials) ventured through the pass and reached the other side. They recommended that due to the other drivers’ inexperience that they take another route. The nine tractors were put on a train to Collado de Villalba, 32km (20 miles) outside Madrid, where they were detrained and finished the trip by road. They arrived in Madrid in the early hours of October 12th 1935 and were given Skoda guns to tow to take part in the military parade to coincide with the Fiesta de La Raza/Día de la Hispanidad (the national day of Spain, which commemorates the anniversary of Christopher Columbus’s first arrival in the Americas). The Trubia arms factory workers who had driven the tanks to Madrid were given army uniforms and participated in the parade, which went down the Castellana Avenue to the War Ministry, where they were inspected by the War Minister José María Gil-Robles y Quiñones. It can be assumed that these nine tractors remained in service up to and including the Civil War and were used throughout it by the Republican forces defending Madrid and its surroundings, though any evidence is yet to be found to support this claim. At the same time, one tractor (it is unknown if it was a newly built one or one of the already existing ones) was exhibited in front of a commission from the Ministry of Agriculture, but no contract was granted. In late 1935 or early 1936, four new tractors with BOMAG engines were intended to be built, but only one would be before the Spanish Civil War broke out in July 1936. This tractor would later be taken to the Juliana Constructora Gijonesa S.A. factory in Gijón (Asturias) and may have been converted into a tank. When the Nationalist troops took the factory following the fall of Gijón on October 21st 1937, a Landesa tractor (which may or may not have been one which was transformed) was taken, and, by order of Landesa Domenech, sent to the small town of Porriño (Pontevedra) in north west Spain to be used for agriculture. Building on their success, at some point before October 1934, Landesa Domenech and Areces, with the assistance of Juliana Constructora Gijonesa S.A., proposed an armed and armored version of the tractor for the Army. Two (most likely the ones with SEFA engines) were converted at this point at the Juliana Constructora Gijonesa S.A. factory or at the Industrial Química de Nalón facilities in Trubia. However, the Army showed no interest and none were purchased. The Landesa tank. Note the missing machine gun – Photo: Artemio Mortera Pérez (2007), p. 12. Quite simply, the tank version was the tractor with added armor and a machine gun. The space around the driver and his assistant was covered with slightly inclined steel riveted sheets. Atop this structure was a cone-shaped cupola for entry and access. The front sheet of the crew compartment had to its left a small rectangular hatch which opened to the left. Attached was an oval stroboscope with horizontal turn which allowed for permanent vision. The right side of the frontal plate had a small circular opening with a mount for a Hotchkiss M1914 7mm machine gun. The whole front of the vehicle remained the same with the exception of the headlamp, which had been removed. The overall armor of the tank was 15mm thick chromium-nickel steel plates riveted to each other. 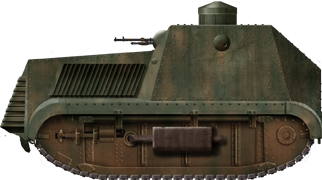 Illustration of the Landesa Tractor tank by Tank Enyclopedia’s own David Bocquelet. Popular myth and culture have led to an image of the Second Spanish Republic as a radical, progressive, and left-wing state. Whilst there is some substance behind this, it is not entirely true. In the second elections held in November 1933, the centrist Partido Radical Republicano (PRR) of Alejandro Lerroux came to power with the support of the right-wing Confederación Española de Derechas Autónomas (CEDA). Following a crisis of government in September 1934, CEDA removed their support and demanded that the PRR enter a formal coalition with 3 CEDA members to take a ministerial portfolio. Despite opposition from the left, this was done, and as a consequence, the most left-wing elements began to mobilize. An indefinite revolutionary general strike organized by radical elements of the Partido Socialista Obrero Español (POSE) [left wing social democrat] and Union General de Trabajadores (UGT) trade union with the support of elements of the Anarchist Party and trade union and the Communist Party was called for October 5th 1934. Following a few days of strike, the revolution was brutally put down, except in Catalonia, where an independent state was declared, only to be toppled by Republican forces a few days later and in Asturias, where the workers, mostly miners, were well armed and mobilized. By October 6th, the town of Trubia was taken by revolutionary forces consisting of mainly factory workers who commandeered two modified Landesa tractors in the town, though these, apparently, for some reason, lacked their engines. The factory workers fought off the Civil Guard forces, though it is unknown if they used any of the available vehicles (there were also up to three Trubia Serie A in the town). By the 14th, state forces were putting down the revolution. In a last-ditch attempt to save the revolution, an armored train was sent down the line from Trubia to the neighboring Grado where it defeated the state forces. Another armored train was hastily prepared in Trubia using locomotive number 2544 ‘El Cervera’ of the Northern Railway. The train itself was only minimally armed, but it had two open-topped carriages and upon each a Landesa tank was placed. Until the re-discovery of several photos in the October 1934 edition of Estampa magazine, it was believed that these two tanks on the ‘Cervera’ train were, in fact, Trubia Serie A’s. Photos showing two converted Landesa tractors onboard flat trucks as part of the ‘Cervera’ armored train during the 1934 October Revolution in Asturias – Photo: Artemio Mortera Pérez (2007), p. 16. By the 17th, the revolution in Asturias was crushed and what happened to the two Landesa converted tanks is unknown. War has the habit of creating new opportunities for rejected vehicles, and the Spanish Civil War started in July 1936 would be a testament to this. To most people’s surprise given Oviedo’s history, the coup there was successful and the city would be the only main city in central northern Spain to join the nascent Nationalist forces. Trubia, on the other hand, remained loyal to the Republican government forces, and a Trubia Serie A tank and at least one converted Landesa tractor were pressed into service by the workers and militiamen in the town. The two Republican tanks were first used in an offensive against Oviedo on September 10th 1936, seeing action in the small town of Las Cruces (north of Trubia and north-west of Oviedo) and Loma del Canto, on the outskirts of Oviedo. In Loma del Canto, both broke-down in no-mans-land apparently because of a burnt-out clutch caused by the inexperience of the crew. Efforts were made to recover the tanks, but this was not possible until October when Loma del Canto was captured. On October 27th, a converted Landesa tractor was lost to the Nationalists near the Naranco Hill (north of Oviedo), who towed it back with a Trubia Serie A tank. This incident would receive lots of attention from the besieged troops in Oviedo. Series of photos taken in Escandalera Square (Oviedo) on October 27th, 1936 showing the Nationalist Trubia Serie A nº3 towing a Landesa tank captured at Naranco Hill. The towing through the streets of Oviedo received lots of attention from the besieged Nationalist troops. Note the improvised camouflage on the Trubia Serie A with branches and foliage. Also note that the Landesa seems to be missing the tracks’ side cover – Photo: Artemio Mortera Pérez (2007), p. 41-43. More photos taken in Escandalera Square (Oviedo) on October 27th 1936, this time with Nationalist troops posing with the captured Landesa tank. Note the cupola and front left hatch openings – Photo: Artemio Mortera Pérez (2007), p. 42-43. The captured modified Landesa tractor would be repaired and pressed into service with the Nationalist forces. The last knowledge of this vehicle was at some point between the end of 1937 and the beginning of 1938 once the war in the northern part of the country had finished. It was reported to have been seen in the Santo Emiliano Hill, halfway between Mieres and Langero, attached to an artillery unit which was presumably using it for towing. At the end of 1936 or the very beginning of 1937, the order was made to build four modified tractors in the Juliana Constructora Gijonesa S.A. factory in Gijón for use of the Republican Army of the North. Some days after January 23rd, Santiago Saiz Palacios, the Chief of the Tank Battalion of the Army of the North, visited the factory to assess the progress. It is known from photographic evidence that on January 5th the frame for one had been built and one had an engine but was missing the tracks, armor and machine gun. 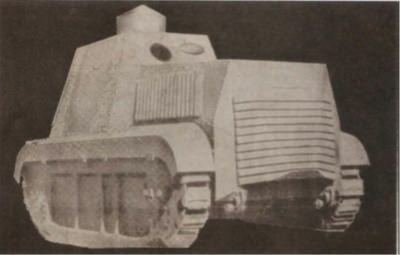 There is also a possibility that these were just the completion of the four BOMAG engine equipped tractors which had been intended to be built before July 1936, but this time in the tank version. A document made by the Servicio de Recuperación Nacional [Nationalist Recovery Service] after the fall of Santander in August 26th 1937 noted that the total of Republican vehicles captured in the final push on Santander were “13 Renault … 3 Trubia … and 2 Trubia/Landesa in Guarnizo”. These ‘Trubia/Landesa’ were most likely modified Landesa tractors which could have been part of those built in Gijón in January 1937. Their ultimate fate is almost impossible to determine, but none survived the Civil War. Series of photos taken on January 5th 1937 by Constantino Suarez at the Juliana Constructora Gijonesa S.A. factory in Gijón showing different developments in the construction of four Landesa tanks for the use of the Republican Army of the North. 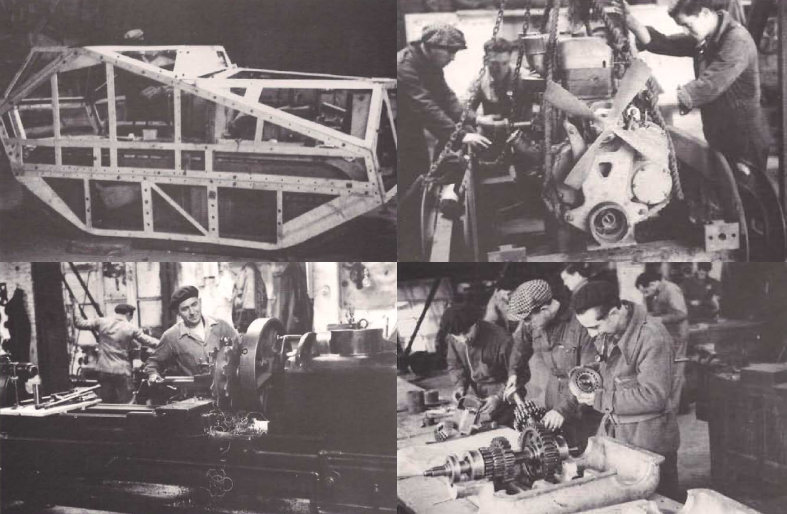 Clockwise: the frame of a Landesa tank with the tracks yet to be added; an engine being introduced into the minimally armored frame with tracks of a Landesa tank; a worker finishing the details of a sprocket wheel; a gearbox being built by factory workers – Photo: Artemio Mortera Pérez (2007), p. 73. The names and designations in the literature for the whole series of vehicles designed or inspired by Landesa Domenech and Areces are inconsistent and full of misinformation. After the first trial of the tractor in Malmasín, its creators christened the tractor ‘tractor Landesa’, in honor of Landesa Domenech. It is unknown if they ever received an official army denomination once they were pressed into service. The modified tank version is even more problematic. As it never entered service properly it was never given an official name, and it does not seem that Landesa Domenech or Areces gave it a name. As such, throughout the article, the terms ‘Landesa tank’ or ‘modified Landesa tractor’ have been used. 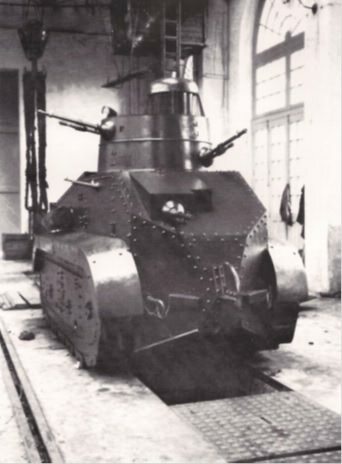 However, Artemio Mortera Pérez (one of the better-known authors on AFV usage in the Spanish Civil War), calls them ‘Carro Areces’ [Areces Tank]. This is not an arbitrary decision. Landesa Domenech had joined the Nationalist side, so naming a vehicle after an officer of the opposition was not a good move. Mortera Pérez uses the name of the other inventor (Rogelio Areces) to designate the tank. Nonetheless, no documents from the period use this designation. To make matters worse, as stated before, the Servicio de Recuperación Nacional document made after the fall of Santander names them ‘Trubia-Landesa’. This was an easy mistake given the striking resemblance with the Trubia-Naval tanks which were inspired by the Landesa tractor. 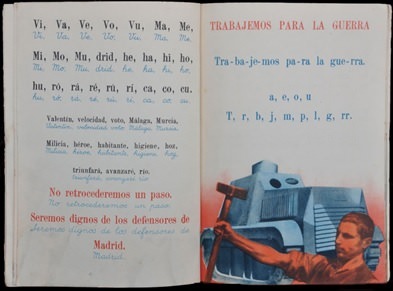 It is interesting to note that in the first edition of a booklet created by the Republican authorities to teach the soldiers and militiamen on the front how to read and write, a Landesa modified tractor was featured. This is very odd given how rare these tanks were. By the second edition though, it had been replaced by a UNL 35. The Landesa tractor was proof of the determination of Landesa Domenech and Areces, who after the failure of the Trubia Serie A, persevered to create a tractor based on the same principles as their tank. Even though it initially seemed that this new project was going to fail, they convinced the Army authorities to buy their tractor after a series of successful trials. Despite the design flaws and the unreliability of their suspension, the tractors (including the tank version) managed to perform reliably and their field life-span seems to exceed that of any of the Trubia family. The Landesa tractor would go on to heavily influence the Trubia-Naval, a light tank which entered service in 1936 and fought in most of the War in the North.